This was a version of "O Sole Mio," the song Elvis recorded as "It's Now Or Never." Elvis's home recording, made in Germany during his military service, together with "I'll Take You Home Again Kathleen," "I Will Be True," "It's Been So Long Darling," and "Apron Strings" was released as "Bad Nauheim Medley" on "Platinum: A Life In Music" in 1997. Tony Martin was born Alvin Morris on 25 December, 1913, in San Francisco. He became involved with popular music already in his school and college days. In the 1940s and 1950s he enjoyed some popularity as a radio peronality. His recording career began in earnest in the mid-1940s (an earlier attempt having been cut short by WWII), when he signed with Merury Records. 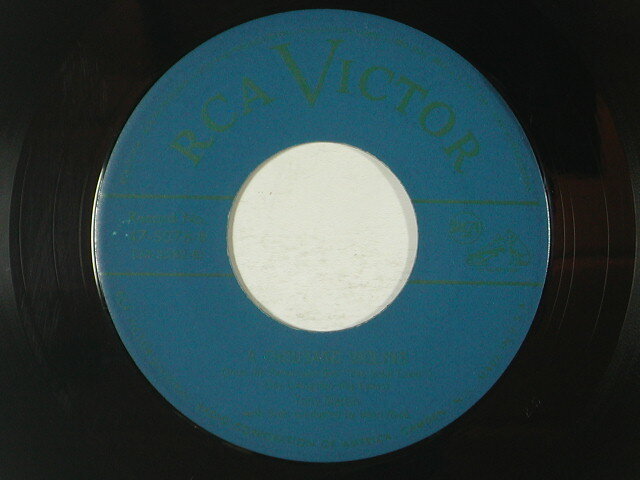 Success on that label prompted RCA Victor to take him over in 1947. He recorded the original version of "There's No Tomorrow" in 1949, releasing it on RCA Victor 20-3582 (78 rpm) and 47-3078 (45 rpm). The number reached number two on the Billboard charts, with a run of 27 weeks. Tony Martin died on 27 July, 2012.